264 pages | 18 B/W Illus. The boundaries between secessionism and separatism are often blurred, and in many cases study of secessionism encompasses that of separatism and vice versa. Recognising this inherent relationship, this book provides a comparative survey of recent attempts at secession and separatist movements from across Europe and Asia, and assesses the responses of the respective host governments. The essays address two main questions which arise from the relationship between state governments and secessionist movements: first, how secessionist or separatist movements gather support and mobilize their target populations and second, how central political authorities respond to the challenges that secessionist or separatist movements pose to their capacity to control the country. 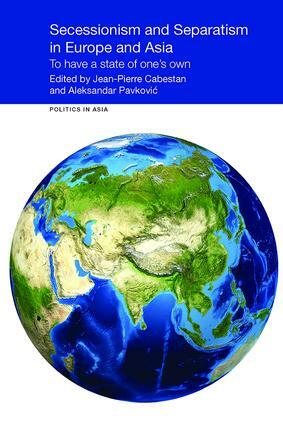 With political analysis of recent cases ranging from the Balkans, the USSR, the UK and the Basque Country, to Sri Lanka, Burma, China, Tibet and Taiwan, the authors identify both similarities and differences in the processes and outcomes of secessionist and separatist movements across the two distinct regions. This volume will be an invaluable resource for those who wish to understand the dynamics of secessionist movements and as such will appeal to students and scholars of Asian and European politics, comparative politics, international relations and conflict studies. It will also be helpful to practitioners and policy-makers who wish to understand and contribute to the resolution of such conflicts. Jean-Pierre Cabestan is Professor and Head of the Department of Government and International Studies at Hong Kong Baptist University. He is also associate researcher at the Asia Centre at Sciences Po, Paris, France. Aleksandar Pavkovic is Associate Professor of Politics at Macquarie University, Sydney, Australia.